This week on ‘The Writing Life of:‘ I am thrilled to be interviewing author SL Browne. SL Browne will be sharing with us detail of her writing life, telling us all about her latest book ‘Magnus and the Jewelled Book of the Universe‘, which was released on 21st November 2017, and answering a few fun questions too. SL Browne is a teacher who writes books for children aged 7-11. Her first book is Magnus and the Jewelled Book of the Universe. When she isn’t writing, SL Browne likes walking, cycling, drawing, reading books, eating chocolate and wondering how to build a Time Machine. I always wanted to teach. Pretty early on in life I realised I could never do a desk job, I’m too restless. I loved art, science and telling stories; teaching was the only job that let me do that. Children keep you cheerful. I laugh every day. They are so wise. We tend to underestimate children. They see things far more clearly and understand more than most people think. I cut my teeth on Laura Ingalls Wilder, Joyce Lankester-Brisley, Joan Aitken, Roald Dahl and, of course, Enid Blyton. I also loved Arthur C Clarke and I had a book of facts that was well thumbed. I loved stories about adventure and human endurance. Even to this day I like to read about explorers like George Mallory, Shackleton and Captain Scott. They were such brave people, the astronauts of their day. I started out telling stories. I made them up in the back of the car to entertain my sister on long trips. It was mainly to divert her from whacking me on the head because she was bored. Then I started to write them down. The first stories were terrible, but important, I suppose, because they were part of my writing journey. My son helped me realise my dream. He went on a long holiday with his Dad, a sort of boys’ adventure in the mountains, and he ordered a chapter to be emailed to him every evening. It had to include dinosaurs, space and adventure. It was a challenge and he was a very useful critic. Basically: cut the description and more action. He also advised me to keep the volumes short, telling me firmly, “No 8 year old wants a big thick book. It puts you off!” I started writing the books five years ago. When I read the first one again last year, I realised it was still good. It even made me laugh. After a concentrated edit, I was sure the story would entertain other children too. Do you aim for a certain amount of pages, or words before you stop writing? I have strict instructions to provide a chapter a day. That motivates me. I make sure I’m in a quiet place with no distractions. I have a bottle of water and some chocolate nearby. When I get into the “writers’ focus-zone” I’m lost to the world. A volcano could erupt outside and I wouldn’t notice. I’m in the story. I’m in that world, until the chapter reaches its natural conclusion. I’m not sure. At the moment, no, but you should never say never. Only chocolate and water. I do tend to walk out my stories, or think them through while cycling. I thrash out everything in my head well before it hits the page, but my characters do surprise me sometimes. They can turn a story unexpectedly. My characters are very real; their voices are always with me. I type on my trusty lap top. In the past I wrote by hand. There are lots of embarrassing folders full of complete works, patiently written in blue fountain pen, stashed away somewhere in my attic turning yellow with age. I’ve written five books in the Magnus series. I’m currently working on the sixth book. Definitely a plotter, but sometimes the characters have other plans. No, I don’t read all the reviews. I realised early on that not everyone will like the book. But those who do may have something constructive to say, and that’s great, but reading reviews from people who haven’t understood the book, or people who aren’t part of the target market that try to over analyse a children’s story can be a bit wearing. In S. L. Browne’s debut children’s book, a small boy called Magnus is whisked away from a dying overheated Earth by his mentor Marlo, only to discover that he belongs to a tribe of aliens known as the Guardians of the Universe living in a different dimension. Marlo, a very ancient and disgruntled wizard, has failed to stop the evil Murdamond from destroying Earth through his unquenchable desire for shiny and beautiful things. When Magnus arrives on his home planet, he finds that humans have not yet evolved and that dinosaurs still exist. Marlo tells Magnus that he fears that Murdamond will try to move to this new, healthy planet to steal all of its treasures now that he has ruined the old Earth. Upon their arrival in the Deruweld village, they discover that Murdamond has already arrived and he is holding Magnus parents hostage in the dungeon of his brand new castle. Magnus realises he has been tasked with a dangerous and urgent problem to solve. He has to save his home planet, rescue his parents and save the Universe from the ghastly Murdamond and his henchmen. He must use all his wisdom and powers, along with his dinosaur friends and the strange Jewelled Book of the Universe that decides life would be more interesting if it transformed into a girl, in order to defeat Murdamond before it is too late. It took me nearly six years to finally hold Magnus and the Jewelled Book of the Universe in my hand. The story grew and developed from many years of writing and working with children. It can be very complex writing for younger children. They like pace, repetition, simpler language, security and drama. You have to be careful not to patronise as well. It was a difficult task. The names fell into my head. Marlo shares many of Merlin’s traits. Murdamond kills worlds and Magnus, the great balancer, is destined to be great. Trumper the farting dinosaur, was conceived well before the arrival of The Donald, by the way. What makes them tick? Marlo is a very bitter Guardian Alien. He’s tried and failed over long centuries to encourage humans to look after the Earth. He’s very fed up and cynical, but he has hope in Magnus, who is still fresh and can see the good in people. His arch enemy is Murdamond. A greedy, relentless consumer who just loves shiny and beautiful things. Murdamond is vain and cruel. When he’s spoiled planet he just moves on to the next one. 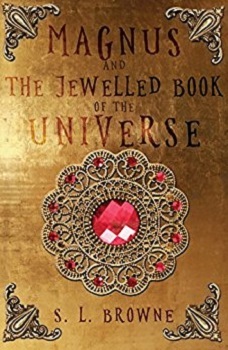 The Jewelled Book of the Universe is very complex. She is learning day-to-day and sees everything as an opportunity and an adventure, but she has a high value on justice and fairness. She is a character that surprises me the most. Interestingly, her voice is intuitive and comes from my stomach. The other voices resonate clearly in my head. Good question. I don’t think any scenes have been very hard so far. The first few lines were difficult, because so much is resting on them. It was a beautiful day and I was walking to school. I walked past a garden that had wisteria and jasmine hanging over the wall. The garden was so beautiful, and the perfume so powerful, it stopped me in my tracks. As I stood there, the title came to me in an instant. It just seemed perfect. I’ve no idea why or how it happened, but I remember it vividly. Yes! My son, till he was fed up. And my cousin, who sent it to one of his friends to read. They liked it and that gave me courage. I knew I wanted it to be at its best. I went for a full edit and proofread. It’s impossible to spot your own mistakes. I didn’t send my book to any agents or publishers. The nature of publishing has totally changed since the internet. It just seemed to be a waste of time and energy. I wanted the book out there for children to hold. So, in the spirit of all the adventurers before me, I just took a risk. Troubadour offered an excellent service. I’m very happy with their advice and their vision. They’ve been incredibly supportive. I sent it to my son who read it and said, “That was very good, but when are you starting the next one?” Like I said, he’s tough. I’d like to finish the sixth book and then I’ve a few ideas for two other books, but for adults this time. They are churning around in my head and are keen to get out. I hope Magnus sells well so I can publish the second one. Fingers crossed. Hot spiced curries, and chocolate, of course. Crimson, no yellow, no, crimson, or maybe yellow. Hmmmm… tough one. I’m rather fond of The Day After Tomorrow. A small house in the mountains with a smokeless wood-burning stove and a big window, so I could sit in an armchair and watch the snow falling. You can find out more about SL Browne by visiting the website/social media sites below. I would like to say a big thank you to SL Browne for sharing with us details of her writing life, and for a wonderful interview. I love The Clash. It’s funny that her son pushed her to get the done. Great interview! This book sounds interesting one I think most children would devour! One of the more clever talking ducks answers I have seen thus far! Excellent interview. Kids give the best feedback. My boys are brutally honest at times but that’s exactly what an author needs. Will get a copy for my son. A chapter a day! Wow. Wow, if I could do a chapter a day…good stuff! I thought of being a teacher too. It’s great that your little one inspired you to write. Great interview. Great post and interview, thank you so much for sharing your awesome post. Another fantastic interview, as always. This one was a ton of fun to read through! I love how she sounds like the kind of person that likes to control things, but also just goes with it when things get turned upside down. A really enlightening post, Stacey. Thanks to you and S L Browne. Blessings to you. Great interview! Chocolate and water…what else do we need to get into that zone!